Experimenting with loose top knots and stealing jumpers from my mother. This week feels as though it’s gone on forever and that I’ve done very little other than shuffle things around and get myself back into routine. Lots of little ties seem to be (finally) coming together. It’s about time. I’m ready for a new direction. Still gutted to be home from India. I miss being on trains where cups of chai and piping hot samosas only cost 5 rupees. 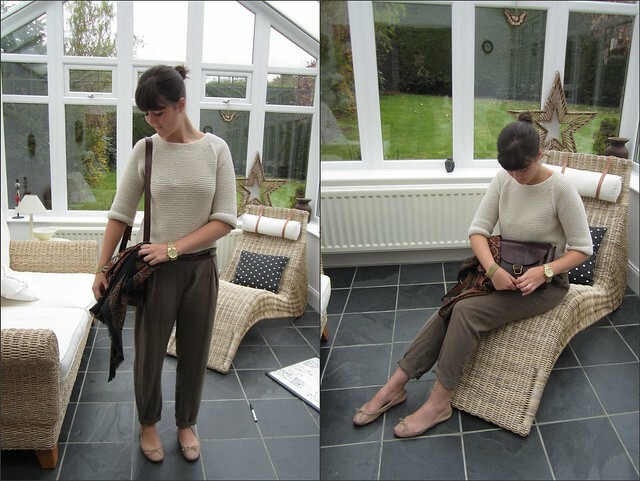 jumper: Noa Noa, trousers: Topshop, belt: H&M, watch: Michael Kors, gold cuff: from India, bag: Venus Leather, Pushkar, ballet pumps: Topshop, scarf: vintage. Next Post old faithfuls and new old favourites.. I love the neutrals in this look – so chic! I want that jumper!